I wish I could go! Ita aweosme to see TOS being supported! Is there anyone going to play strictly TOS?? I’ve played Titania quite a bit now and some things feel odd to me. Especially during the last game I played against Kirai. The Fae keyword is made up of mostly minions that are 7 cost or higher (except bultungin). It really feels like there aren’t a lot of cheap options for scheme runners in the keyword. You can see from the scheme pool that this crew was just awful with this and I knew it going in. I wanted to play it out and see if I could make anything work with the expensive minion models. I’m my mind I could have 1 rogarou do Vendetta and the other to run Power ritual with a Bultungin while the rest of the crew fights it out in the middle for corrupted idols. However, that’s not what happened. My crew got slaughtered in the fight in the middle. The Power ritual models made it to their corners but not for long. One was being lured away and the other was going to die next turn. My my main concern is that with the high cost of the minions it doesn’t leave you a lot of room to hire any beaters. It felt like to go up against this crew I would need runners and beaters and the cost didn’t allow for both. Titania, 2x Autum Knights, 2x Rogarou, 1x Bultungin, Gorar, Aeslin, plus 2 upgrades Schemes chosen- Power Ritual and Vendetta on Toshiro (I didn’t realize he was a support model now) Kirai, Ikiryo, Datsu Ba, Francis, Jaakuna, 2x Seishin, Toshiro, Gravedigger, plus 2 upgrades Schemes chosen-Power Ritual and hold up their forces. Kirai vs Titania strat and deployment- corrupted idols/flank scheme pool: Take prisoner- requires you to target enemy minions. All I had were minions and my opponent had zero minions. Power ritual- possible to do with this crew but left limited amount of models to do strat or other scheme. Assasinate- chances of killing Kirai.... slim chance probably and not a good pick for this crew. Hold up their forces- all of my models were higher cost than my opponents or same cost making this a bad choice. Vendetta- once again... my models are all higher cost so this wouldn’t be a good pick (except for my Bultulgin which was running for Power ritual). In 2nd edition, if you gained the fast or slow condition during your activation, it would carry over until your next turn. Does anyone know if this has changed? can’t find it in the beta rules. Thanks! Just pictures of boards, games and minis! REGISTRATION IS OPEN!!! Please see details below Califaux Texas Edition: Fauxmageddon Califaux Texas Edition: Fauxmageddon Hello and welcome to Fauxmageddon! Do you have what it takes to win the Fauxmageddon showdown and claim the title of Fauxmageddon Master? This is your chance to gather your crew and battle it out in the Lone Star State to show the world that your meta has what it takes to be the Fauxmageddon Master! The East Coast meets the West Coast on the Gulf Coast for a test of true skill and strategy! The end is nigh and the Fauxmageddon approaches--will you win the duel to be the last meta standing? Fauxmageddon is a 3-day weekend event held in Houston Texas at Dragon’s Lair Comics and Fantasy. The weekend will consist of a team tournament, a 50 soulstone 2-day master’s tournament, and a 50 soulstone story encounter. Gaining Grounds for 2018 will be followed. Location: Dragon’s Lair Comics and Fantasy 21151 Tomball Pkwy, Houston, TX 77070 (832) 761-0072 Dragons’s Lair is located just 20 miles from the George Bush Intercontinental Airport. Food & Lodging: Fauxmageddon discounted rooms rates available at the Courtyard Marriott Houston Northwest. (Information for how to reserve your room will be posted shortly) Single and Doubles available at $79.00 per night. Located right behind Dragon’s Lair. Courtyard Marriott Houston Northwest 11050 Louetta Rd, Houston, TX 77070 1-281-374-6464 There is a wide variety dining options a within walking distance of Dragon's Lair. How to register for Califaux Texas Edition: Fauxmageddon We are using Best Coast Pairings for this event. This is an app available on both Android and iPhone or you can access it through a web browser at www.bestcoastpairings.com. Registration will go live on 9/26/2017. Here is how to register- Please paypal the pass amount and include what passes you are paying for to tyrantbuttercup@gmail.com. Include your name and location. I will enter all information into Best Coast Pairings. (I was going to set up the online ticket purchase in BCP but it was too hard to do with the weekend pass and registering for each event separately) Weekend pass: $60.00 Day pass: $25.00 Friday: Fauxmageddon Team Event- Grab your partner and Do-si-do! $25.00 (included in Weekend pass) (Rules to be posted soon) When- Friday June 8th, 2018 Registration- 9:45 am. Please use Best Coast Pairings App. Rounds: 3 or 4 depending on attendance Saturday: Fauxmageddon 50 Soulstone Master Qualifier $25.00 (included in Weekend pass) Gaining Grounds 2018 When- Saturday June 9th, 2018 Registration- Time to be announced. Please use Best Coast Pairings App. Rounds: 3 or 4 Sunday: Fauxmageddon 50 Soulstone Master’s $25.00 (included in Weekend pass)– Top 12 from Saturday Gaining Grounds 2018 When- Sunday June 10th, 2018 Registration- Time to be announced. Please use Best Coast Pairings App. Rounds- 3 Sunday: The Five Riders of the Armageddon, a 50 Soulstone story encounter written by Ted Prodromou $25.00 (included in Weekend pass) A fun story encounter revolving around the Armageddon and the 5 riders. Written by Ted Prodromou!! Every table will have a trinket that the winner will get to take home. Prize Support: Friday Team Event, Sunday Master’s and Sunday Story Encounter will have 1st, 2nd and 3rd place trophies. 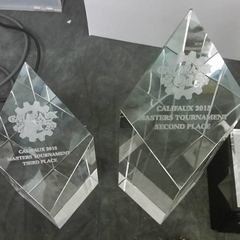 Trophies will be beautiful handmade wood provided by CK’s Wood holding etched glass plaques. https://www.facebook.com/OurWoodIsOnDisplay/ Saturday- Raffle, best paint award, sportsmanship award and top 12 announced for Fauxmageddon Masters! Sunday Masters Ceremony- 1st, 2nd and 3rd place trophies to be awarded to the Fauxmageddon Master’s! Prize support and sponsors to be announced. We are making a fate deck for this event! Details to come once we get it Wyrd approved. Painting Competition: Details to be posted soon. We are working on something fun and creative!